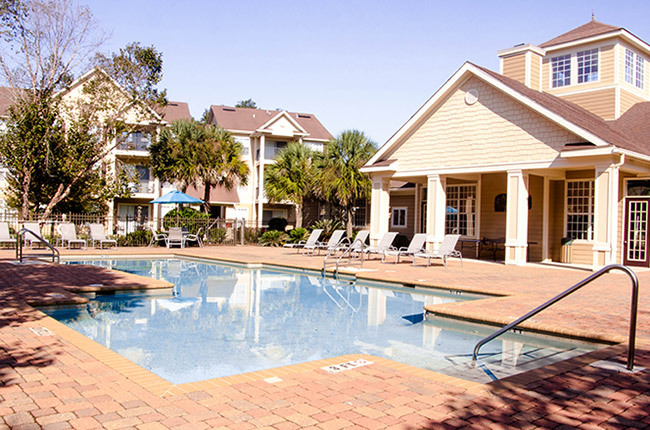 Experience the best luxury apartments in Pensacola, Florida at Village at Southern Oaks. Our elegant apartment community offers up the resort-style lifestyle you’ve been dreaming of! Our lush landscape features stately, hundred-year-old oak trees and a shimmering lake with fountain, providing residents with a tranquil atmosphere as well as a breathtaking view from every window. Each of our one, two, and three-bedroom homes exude the gold standard of apartment living with designer kitchens, oversized patios or balconies, and in-unit washer and dryers. There’s no limit to the comfort our residents enjoy with our generous suite of community features including a state-of-the-art fitness center and a resort-style swimming pool with hot tub. For the luxury you deserve, there’s no better place to call home than Village at Southern Oaks— where your happiness is our top priority. At Village at Southern Oaks, you will find the best of both worlds: a charming, neighborly atmosphere with all the excitement of Downtown Pensacola nearby. Our picturesque apartment community offers seamless access to US-90, allowing you to enjoy all the city’s best shopping, dining, and entertainment destinations. Pop over to Cordova Mall where well-known fashion brands such as Dillard’s, Charlotte Russe, and American Eagle promise to spice up your wardrobe. If you feel like dining out for an evening, you have options to suit every craving from the casual Southern seafood at the Fishing Hole to the Coach-N-Four Steak House, a local favorite that’s mere minutes from your door. Whether you’re looking for an effortless commute or want all the sight-seeing fun of the waterfront close-to-home, you can have it all at Village at Southern Oaks.